← How to Switch to Firefox 3.1 Beta 3? I have taken an interest in being better at personal finance after landing in my first job 6 years back. I have tried using Wesabe – the social personal finance management tool. Now, I am a firm believer in Mint as it lets me track all my financial accounts easily in one place. I will share my views on Mint in another review shortly. I like online banks such as ING Direct to save money at a better interest rates than what the brick and mortar banks offer. I was recently introduced to SmartyPig by my buddy @mattjabs of Debt Free Adventure – a great inspiration for me in the personal finance front as well. (I am on Twitter too). 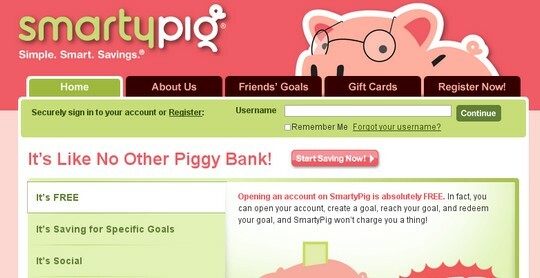 SmartyPig is simply a savings account dedicated to a goal that you can simply tap into when you have reached that goal. While earning a nice 3.25% APY on your savings. You could do this by opening multiple accounts within your ING Direct account as well. But, SmartyPig differs here by adding the social angle to it. Plus, once you have set up your savings account, the deductions happen automatically. You won’t miss the money or spend it if you had what you have to start with after the deductions. Just like any other payroll deduction. You can choose to keep your savings goal private or chose to share it with friends/family. Share your public goals via widgets on your blog or social media sites like Facebook, MySpace or via email. Setup as many goals as you want and start funding them automatically. The funding stops as soon as the goal is reached. Funds are handled by West Bank – a FDIC insured bank. 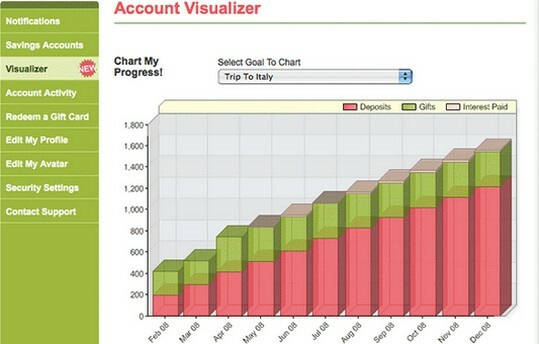 Integrate your savings account into the web 2.0 personal finance sites such as Mint, Wesabe, Yodlee, etc. It’s FREE for SmartyPig customers. If you are not a SmartyPig customer and want to make a contribution or buy a SmartyPig gift card with a credit card, then you pay a flat $2.9% in fees. You have to be a US Citizen. Resident aliens with a Social Security Number must provide their passport number, country of issuance and expiration date. Plus, you also need to provide your drivers license number to create an account. SmartyPig is a great innovative way of saving money that can be used for personal finance as well as for group activities like collecting for charity, etc. By making your savings goals public to your friends and family, you can receive the encouragement and support some times we need to do the right thing. Or even get help from them in times of need. One of the SmartyPig testimonials shows how someone setup an account for her sister when she was away with Peace Corps. She was saving for her sister during the unpaid months as well shared it with friends and family who also volunteered to contribute to that account. A great example of how useful this can be. Plus, if you have kids of any age SmartyPig can be a great way to show them the good habit of saving for something they want really. How do you save for your goals? Does SmartyPig look appealing to you? good article, thanks for this useful info, I have dug and stumbled this article. I will keep visiting for more useful information. I allways looking for new information about savings and personal finance. I heard about Mint and now explore their site carefully. Very interesting soft there. It’s really very conviniant to track all financial metters. As for SmartyPig very useful additional information about saving account. A lot of advantages they has. .-= Gene@Instant No Fax Payday Loan´s last blog ..Payday Loans No Credit Check In One Hour =-.